After numerous success and international patents, ZAGO is introducing the new improved Real Feeder series to the livestock market. The Sabre horizontal two counter-rotating auger feed mixer. With Sabre, ZAGO has expanded its machine range with a new counter-rotating augers feed mixer series. 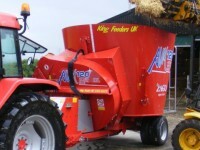 Equipped with an innovative design conceived to offer the purchaser higher performance than traditional mixers, the machine is an efficient solution to modern farm needs, especially for shredding/mixing cylindrical or prism straw and/or hay bales and all types of silage. The Sabre horizontal trailed T.M.R feed mixer series is the solution to medium-sized modern farm needs and offers high yield with limited investments. It adopts the DUO MIX mixing system invented and developed by ZAGO in 1995, making these machines the most appreciated and sold on the market. 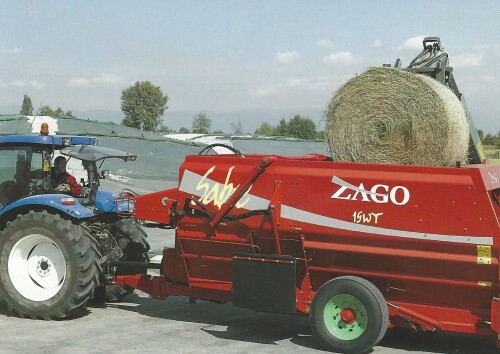 The Sabre 2 horizontal counter-rotating augers T.M.R feed mixer series is characterised by the Zago DUO MIX system that facilitates round bale and tough shredding and mixing. The WL series comes with a rear loader that facilitates loading. The WT series is equipped with a milling device able to quickly cut all the ingredients required for the ration, creating a smooth and compact milled surface to prevent fermentation and the formation of mould, harmful to the animal’s rumen. The SABRE model, in the NT, WL, and WT versions, range from 5 to 17 cubic metres.